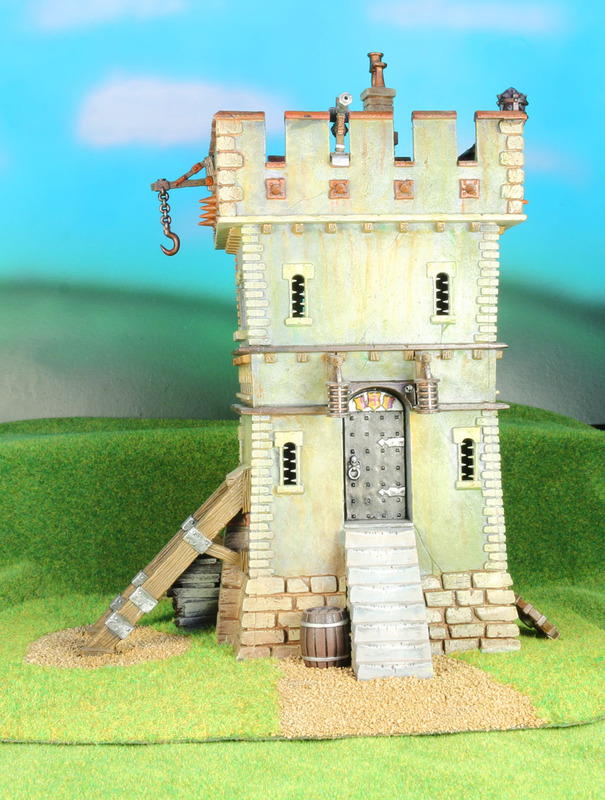 Okay, so this is the last of my terrain posts for a while. I promise! I finished up the Zombies of Karr-Keel commission, so there will be several blog posts directed towards zombies in the near future. But, for now, I've got some more terrain that I finally finished. Although, to be honest, after looking at these pictures, I want to make some changes. 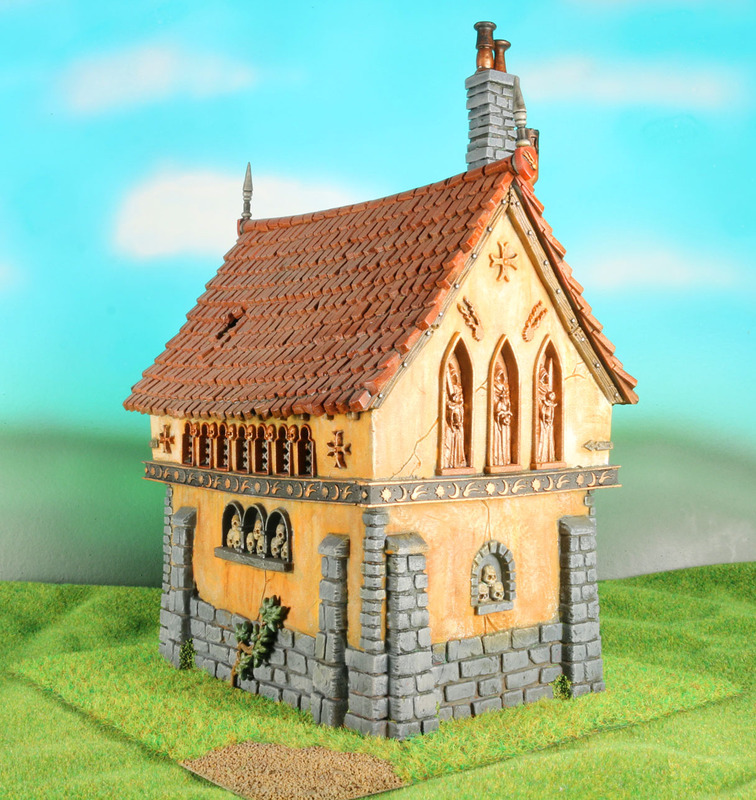 First is the Sigmarite Chapel. I bought this as part of the large fantasy terrain set GW released sometime around 2006-2007. Most of it was painted around 2009. I don't remember how I did most of it, to be honest, but I use quite a bit of brown and ochre oils to weather the stucco. I also attempted to paint the "medallion" over the front door to resemble the friezes of ancient Greece. If you look closely, you can also see some of the old GW flock (the same thing I use on my epic models) used to simulate moss growing on the sides of the stones at the foundation. 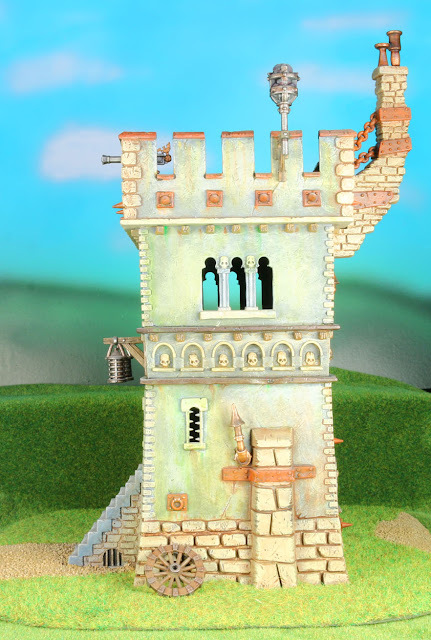 I also finally finished the Watch Tower. Much like the chapel, this had lots of oil streaks using brown, green, and ochre oil paints. This was one of my first attempt at this particular form of weathering, and you can see where the streaks are a little too well defined. I also applied some brown oil washes to the stones at the base to simulate years of dirt being kicked up by horses, soldiers, and the wind. 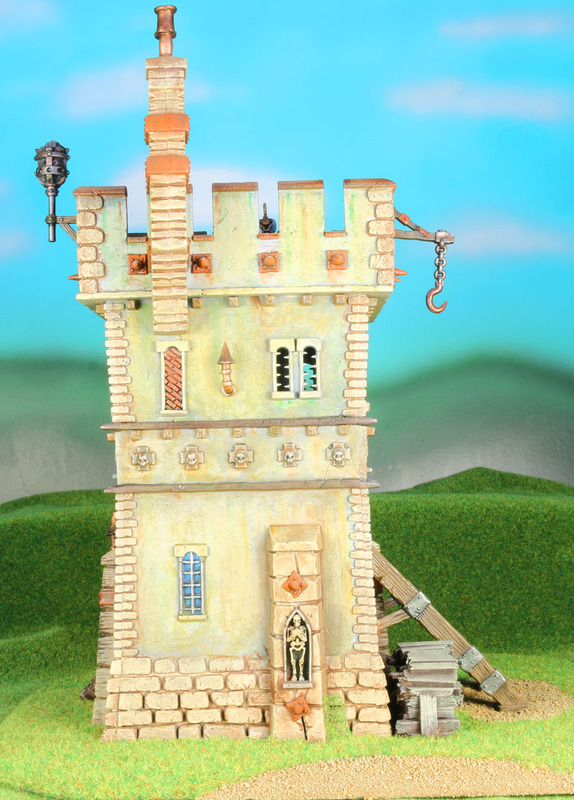 Finally, most of the metals were painted to resemble rust, indicating that the tower guards just kind of let things go. I tried to have a little fun with the base as well, I've added a barrel from the Empire Cannon sprue, a random wheel leaning up against the side, and some firewood made from balsa. So with those done, I've yet to even open the Manor House. I'm not really sure what I want to do with it. 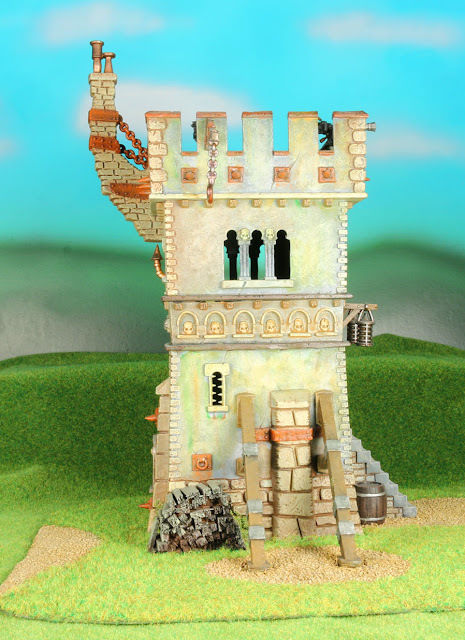 I'd love to put it on a large base with a courtyard like was shown in the US White Dwarf at the time, but I don't have anywhere to store such a monstrous piece of terrain, nor would it allow much use on the table since it would have such a large footprint. I'm sure I'll think of something eventually! I really like the stucco and the medallion on the first building. Thanks, I've always been a stickler for stucco and trying to make sure it looks correct (usually failing miserably). Glad I got it right this time! I really love th emuted colours you used which really fit the kits. The only thing would be I'd have wanted some bricks/stones/tiles to be a bit different every now and then to break those big surfaces. Otherwise, it's just what I want. I agree completely about the uniformity of the stone. It's something I've been working on trying to do better with on some more recent, unfinished terrain. I like these buildings. Maybe could have had fewer skulls, but they look good. 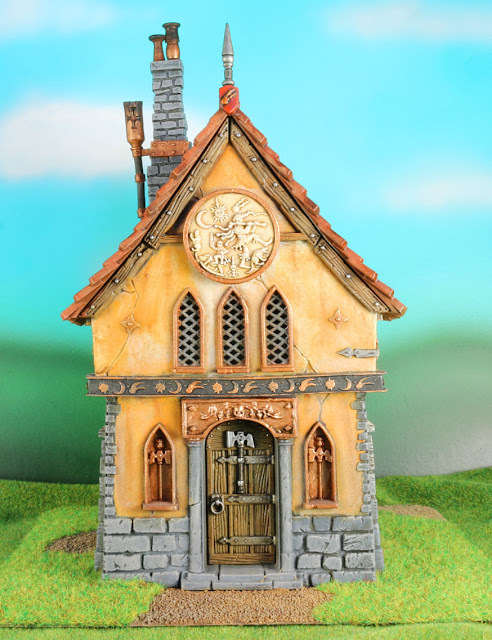 I like how you painted them, some variation in stone/brick color might be more realistic, but done is done. I love that watch tower. So many fun details that you brought out so nicely. Thanks, it was a really fun kit to build. I'm sad that GW discontinued it as it came with a lot of really cool bits and bobs to tack on. These look great! Love the distressed colouring you've gone with mate. 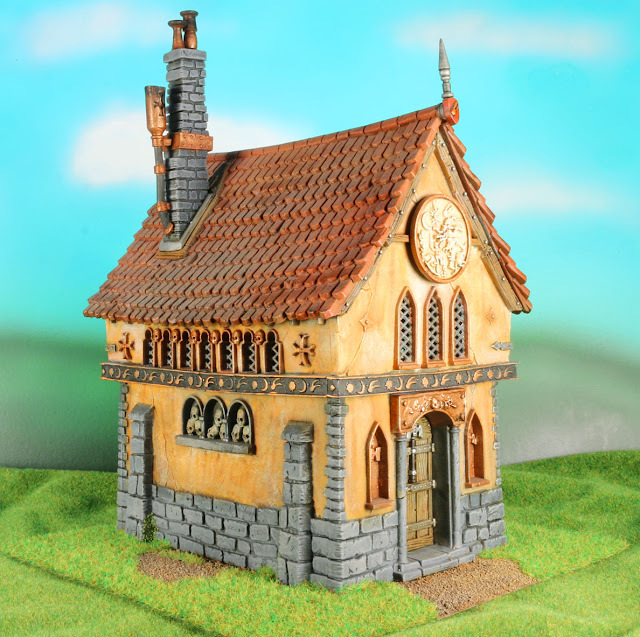 I have the Chapel sat in my queue of things to get painted... for the last 5 years. -__- For some reason terrain is just not as "fun" to paint up as miniatures? I go through phases were I prefer one over the other. No real telling what triggers them.